Another important feature of this week was that we got dividends of our 3 shares we have invested into. Getting dividends from 3 shares, all within the same week is very pleasing and it may be noted that not much time has elapsed since Seema started purchasing the shares using the methodologies provided in the book. I remembered to mention another thing; In the previous edition of this blog on 14th August 2017 Chennai Petro had declared a dividend of Rs. 21 per share for which I had added a sum of 378 in the Balance Sheet. One of my Followers had emailed me to check whether the dividend amount was credited to Seema's Account or not, as the same was not deposited in his account. I forgot to reply the email then due to numerous emails I received after that. I would like to clarify that dividend is not deposited into the account on the record date but is transferred to the shareholders account through ECS. 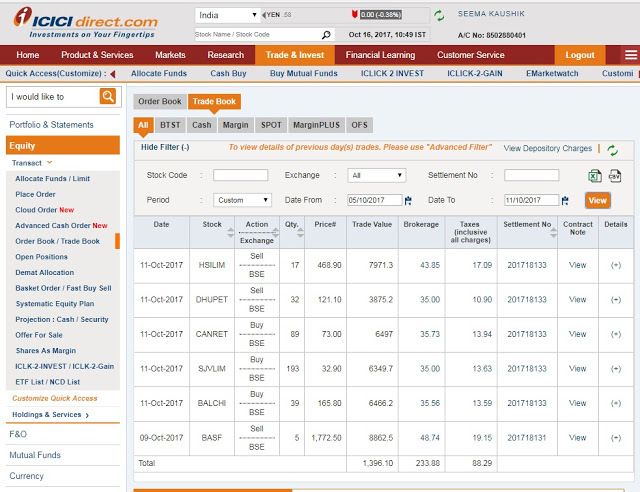 Seema's account was credited with the dividend amount on 30th Aug'17 i.e. the dividend is credited around 15 days after record date. If the follower is reading this story then please write in the comments that he has got his / her dividend, because that will relieve me from the regret of not able to reply to the earlier comment. 1. National Fertilizer has declared 85 paise per share, whose record date was 19 September 2017, so that we get 78 rupees 20 paise dividend on our 92 shares. 2. BASF has declared a dividend of Rupees one rupee, whose record date was 20 September 2017, so that we get 5 rupees dividend on our 5 shares. 1. Jain Irrigation has declared 75 paise per share, whose record date was 14 September 2017, so that we get 44 rupees 25 paise for our 59 shares. So, this week we earned dividends of 127. 45 . Rome was not built in a day. Till now we have earned Rs. 505.45 from dividends and at least it takes care of the brokerage. This week, on 25th Sep' 2017, we had to sell the National Fertilizer in the reverse trading system. I also know here that a lot of my followers don't not like this reverse trading system at all because I am receiving e-mails every day that Mahesh Sir, The Shopkeeper approach suggested in the first book was a better one and we want to follow that, we don't want to sell our shares at loss, Reverse trading is just leading to losses. Before I say something in my defense, I will re-state some facts about the reverse trading system from the previous part of this series, for them who haven't read or have forgotten may refresh the facts. As per the rule, the shares trading 5% lower than its 200 DMA have to we reverse traded i.e. we will share this share and book a loss on it. Remember, this is not an actual loss as we will watch these shares regularly and as soon as it rises more than 5% of its 200 DMA, we will buy it back again. By doing it, we can buy most of the shares at a lower price to what we had sold them at. If our estimate goes wrong and shares gain value very quickly, we may have to buy them at a higher price. Normally such a mis-calculation happens in 5 out of 20 shares that they gain more than 5 % of its 200 DMA after going down 5 % . I had sold the shares of Pratibha industries a year ago, using the reverse trading system and it has not gained 5% more than its 200 DMA since. The share has fallen from Rs. 26 to 7.90 as of today and its 200 DMA is 11.11. If Pratibha Ind. closes as 5% above its 200 DMA, it will close at Rs. 13 So, if i buy it now I will be gaining rather than losing as I will be able to buy the same shares at half the cost compared to when I sold at 26. 1. We don’t cringe on a daily basis seeing the value of our shares go down. 2. If we keep the money received after selling the shares in a bank we get an interest of 3.5 % on a savings bank account, banks like ICICI offer a monthly Fixed deposit scheme at 6.75 %, and we can get a monthly interest of 280 on a Fixed deposit of 50,000. Therefore, instead of holding the loss making shares we must hold the cash received after reverse trading them. In some cases as of Pratibha Ind. The loss is covered by the bank interest itself. 3. Once the shares rise, we can buy the shares at a much lower price. 4. The biggest benefit that we have is if we sell our shares in less than 1 year from purchase then we have to pay an income tax of 15 %. And the fictitious loss we incur in the reverse trading system, we can less that in the profit and only pay 15% income tax on the profit. Actually, during last 14 weeks market has been steady and has not fallen substantially , the decline that was there wasn't actual and thus we had to buy back reverse traded shares of Jain irrigation which created an impression that reverse trading is a loss making method and let's better stick to Shopkeeper Approach. For those who haven’t read the Shopkeeper’s Approach in my Book may see this video. But if there has been a huge downturn in the market and this decline lasted for two to three months, then you will understand the real importance of the reverse trading system. In such a situation the 200 DMA of the shares will come down sharply as well and when we will buy back the shares when they are 5 % above its 200 DMA, we will get a profit of 20 % soon and our losses shall be covered at a lower price where as those who held back their shares at the earlier price will be yet to recover the principle amount. I don't use reverse trading on stocks held by me as I have faith in my research and even if a particular share is not performing for 2-3 years I don't worry. Normally I sell the shares after holding it back for an year. You may be surprised to know that Compucom and Basant Agro shares are still in my portfolio as it is yet to complete 12 months of holding back. In seema's story all the shares are from the Book written by me as all are Blue Chp Large Cap shares , even if we don't reverse trade in these , there is nothing to worry about but I have to be honest to the rules laid down in my book for small investors , and thus I follow Reverse trading here. This time, on September 29, we had to reverse trade on the shares of both Steel Authority and India Limited and Jain Irrigation, with them closing 5% below their 200 DMA . Recently, my followers are annoyed with this reverse trading system because I keep getting comments and e-mails from them about their resentment. They are also right; If they keep reverse trading for small fluctuations where will they earn from? You may simply Hold the shares instead of Reverse trading if you please. But to be true to to the rules suggested in the Book, we will continue with Reverse trading system and after the end of an year its importance will be clear. As of now the market has not suffered a huge downfall thus this process may appear to be not worthy as of now. In yesterday's Research report regarding improvement in Reverse trading methods is about the shares mentioned in my research reports as we mention only those shares whose ratio between higher or lower level is less than 2 or 2.5. These don't apply to the shares mentioned in my Book as here the ration between the highest and lowest value is more than 2 or 2.5. Again, the reverse trading in Jain Irrigation is not wrong, because you can see that the promoter's holdings have also decreased, which is risky. 1. BASF India Ltd, which we purchased on August 23, 2017, we had purchased it at the price of Rs. 1420, which you have read in the previous parts. On October 9, We earned a profit of 352.50 per share after selling it at a price of 1772.50. We had 5 shares of BASF thus we had a profit of 1762.50 but after deducting the brokerage charges we had a net profit of 1640.87. 2. We made a profit on HSIL shares , we had purchased 17 shares at a price of 381.95 per share and sold it at 468.90, thus making a profit of 1317.21 after deducting brokerage charges. Overall Seema Kaushik earned 2958.08 from the share market. Some of you may say that she will have to pay a short term capital gain tax of 15 % on this profit of 2958.08 amounting to 600 approximately. This means that you have not read though the previous part of this series and you need to refresh it. Profit booked in short term can be adjusted with short term capital loss booked in reverse trading system. The profit earned after the adjustment is liable to be taxed under short term capital gain tax. This is the reason why we are not afraid to use the reverse trading system, If we see that the shares sold through reverse trading have some potential we will buy them back as soon as its 200 DMA rises. After a lot of efforts, we found a share ranked 32 of Balrampur Sugar , which was trading 14.32% above its 200 DMA. 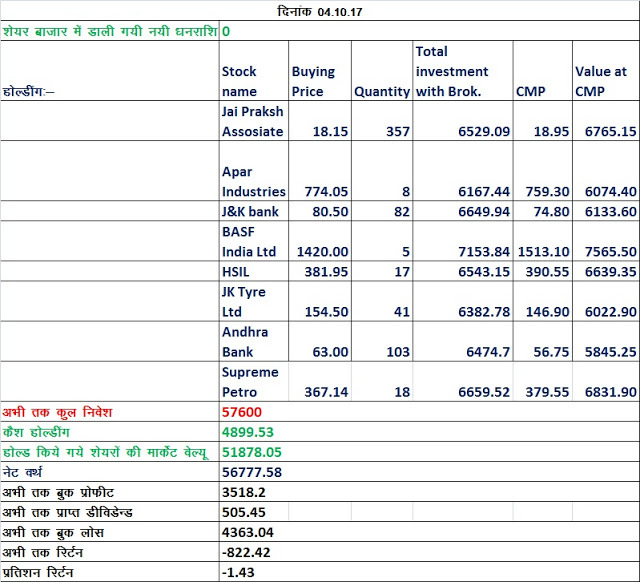 We purchased 39 shares of Balrampur at 165.80, the same may be seen in the trade-book snapshot provided above. You may see in the link to my Blog provided below that I had recommended Dhunseri Petro at a price of 89.40 on 8th Nov 2014. 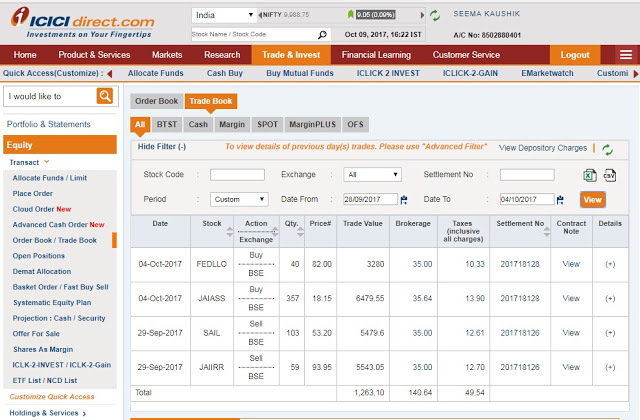 Seema purchased 32 shares at the time on November 10, 2014 at a price of 91 Rupees, Since at that time Seema invested in shares from a sum of 50,000 borrowed from me the investments were smaller and she invested a maximum of 2900 in a share. In 2014 I used to believe in fundamental factors only and did not place the technical dynamics like 200 DMA in its research report, but when the strong recommendation like Dhuniseri Petro failed, I realised that 200 DMA should be considered along with the fundamentals. I am providing an excel sheet where you can see the price and 200 DMA of Dhunseri Petro from 2014 till date. You will see that when the stock was recommended at 89.50 on November 8, 2014, its 200 DMA was 122.37 i.e. the stock was already trading much below its 200 DMA , Reverse trading was not started by us at that time, the share's value failed up to 43 and the invested capital of 2900 was reduced to less than its half. She had full faith on my research and she held the shares based on Shopkeeper's approach. Look in the Sheet above on June 30, 2015, when the stock's 200 DMA was 77.89 and the stock was closed at 82.15, then it was the right time to buy it, after that the stock also went to Rs 113 on August 10, 2015, I didn't let Seema sell it even then saying her not to hurry , I told her to wait more and not to earn a meager profit , I expected the share to go higher. And as it happened, Seema had to bear the consequences of having supreme faith in my research, share started on a downfall and its value on 27th Jan 2016 was 5 % below its 200 DMA, it had fallen upto 77. Seema didn’t reverse trade as it becomes difficult to track all the shares as they are many in number. The roller coaster ride of Dhunseri Petro continued and it gained and reached 121.50, Seema got it off her back after getting 32 % of profit after holding it for 3 years. I didn’t have guts to say her to hold it any longer. Those who complain that they can't purchase shares recommended by me as their prices shoot up should take a note of it. It doesn't cost anything to comment. I really appreciate your comments and the critical comments help me to improve, So keep commenting. 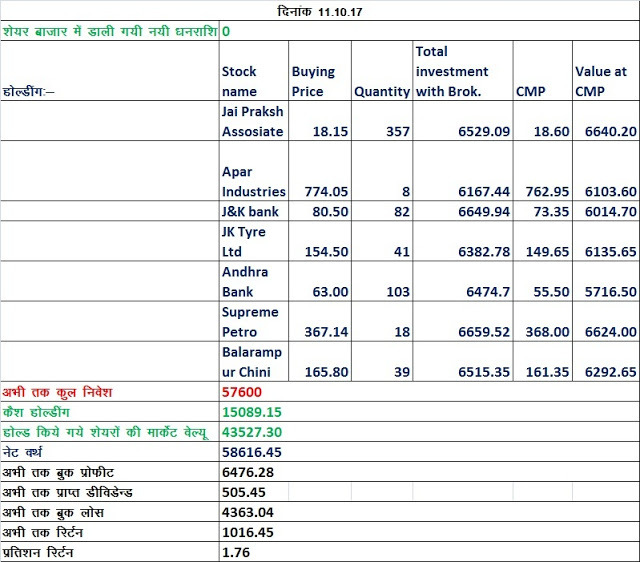 Past Performance of Mahesh Kaushik Fundamental Stock Recommendations Part 1. 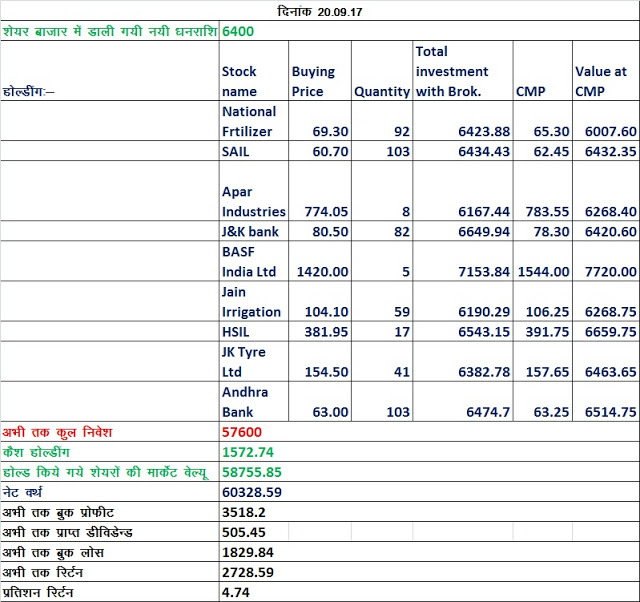 Past Performance of Mahesh Kaushik Fundamental Stock Recommendations Part 2. 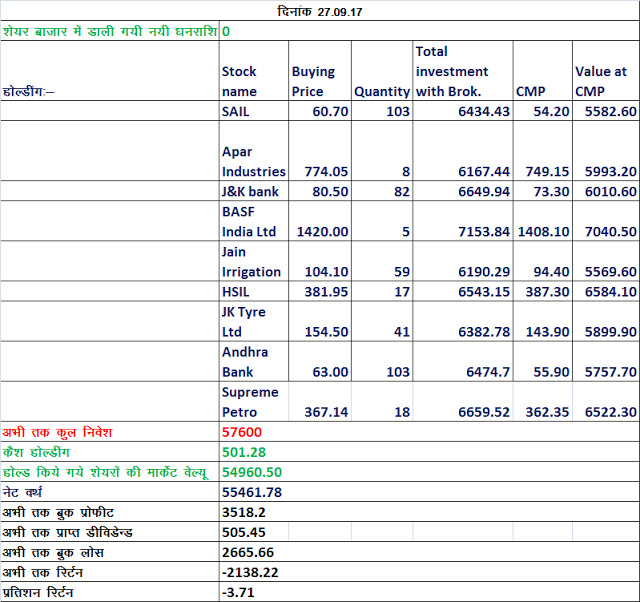 Past Performance of Mahesh Kaushik Fundamental Stock Recommendations Part 3. My 3rd Book "Top 100 Diversified Undervalued Indian Stocks For FY 2017-2018"
You don't need to own a Kindle device to enjoy Kindle books. Download one of Amazon free Kindle apps to start reading Kindle books on all your devices. The Kindle app is available for every major smartphone, tablet, and computer. That means with Amazon free Kindle reading apps, you can buy a Kindle book once, and read it on any device with the Kindle app installed. And of course, you can also read that same Kindle book on a Kindle device if you own one.